Moving companies don’t like shuttling furniture. Customers don’t like the additional costs that come with shuttles. That being said, shuttle trucks are a necessary evil when it comes to moving long distance and it’s important to understand when they come into play. What is a moving shuttle truck? For interstate moves, most moving companies are going to use a big ole 53′ tractor trailer to haul your furniture. Now, depending on where you live, a mover can’t always pull the big truck up to your front door. In that case, they’ll need to go rent a smaller truck to make the final delivery. 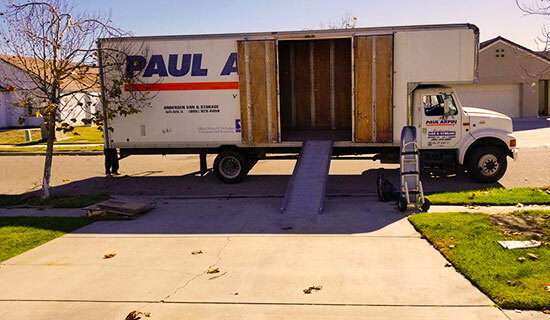 For the mover, this is a lot of extra work and for you, it means more costs. How much do shuttles cost? Regardless of the type of moving estimate you’ve received, shuttle fees can increase your final cost. Moving shuttle fees can run anywhere from $200 to a $1,000+. It really just depends on how big your move is. Moving companies typically charge anywhere from $0.08 to $0.12 per pound with a minimum fee of around $200. This means if your move is 10,000 lbs (typical 2-3 bedroom home) you could be looking at an additional $1,000 added to your total cost. And if you need a shuttle at both your origin and destination location you can multiply that fee by two. However, just because you need a shuttle doesn’t mean you’ll automatically have to pay the fee. Many companies don’t charge if you need a shuttle at the pickup origin. Almost all companies will charge a fee if a shuttle is required at the destination delivery address. Also, in major cities like New York or Chicago, where streets are tight, shuttles are always required and already built into every quote. Some moving companies also pool money together to help cover the costs of shuttles to avoid charging customers additional fees. Be sure to always ask your mover about the possibility of a shuttle and the associated costs. Like we said, movers hate shuttles. It’s a lot of extra work and it’s basically a breakeven deal for them. Consider all the costs involved in providing a shuttle. Customers often think the mover is trying to pull a fast one on them with the shuttle fee. This is almost never the case. If a mover wants to be shady, there are far easier ways to charge you more money than a shuttle. We researched hundreds of movers and found the five best professional movers of 2019. How do movers know if a shuttle is necessary? Moving companies will sometimes send a representative out to see if a shuttle is needed. Movers will also use resources like Google Street View to check out the roads and see if a tractor-trailer can fit. If the truck can’t pull up within a reasonable distance, usually around 150-200 feet walking distance to the front door, then a shuttle will likely be needed. What if I don’t have a destination address yet? Don’t know the exact address you’re moving to yet? That’s actually a fairly common scenario. And there’s no way for a mover to determine whether or not a shuttle will be required without an exact address. The best thing to do in these situations is to get the destination shuttle quote beforehand. This way you know exactly what you might have to pay if the scenario arises. Most movers will offer up this information anyway, but be sure to ask for the pricing if they don’t.